It was a long fifty yards from the back of the trailer to the edge of the water. 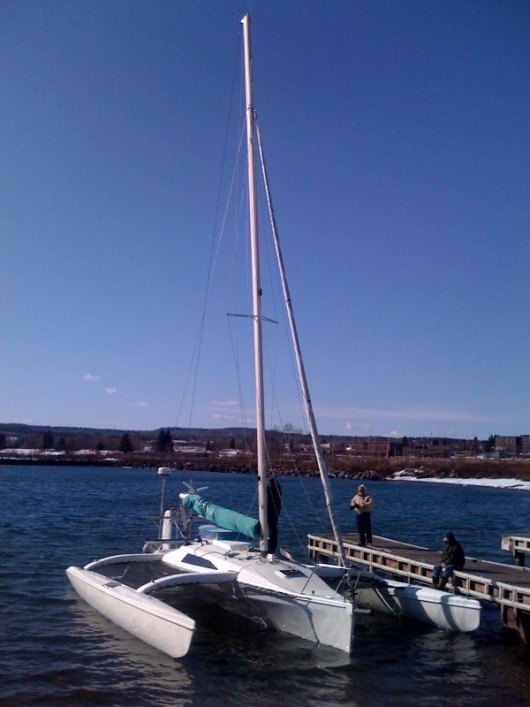 A raising of the mast, leading of the lines, tying of the fenders, the boom in place, foresail raised, tie-downs removed. Yes, a long fifty yards. Ah, but the first night! I spent the evening contemplating the sunset through the hatchway and miles traveled to get to this moment. I didn’t spend too much time on the miles to go, not now. That will come later. I recalled with deep gratitude the wonderful people so eager to help along the way. I’m filled with joy at their helpfulness and well wishes. Special thanks to the people of Two Harbors, MN for their hospitality while we readied the Cap’n Lem. Dan, Mark, the Larrys, Forest and others all contributed to getting me in the water. So we sail tomorrow toward the Apostil Islands. Underway at last. The ice has broken up in the bay. It’s time to launch the Cap’n Lem. All the preparations that can be done have been done. I sit here in my little home-on-wheels overlooking the harbor and city feeling very humbled by what is before me. A dream becoming a reality should always be humbling. I have been blessed beyond my ability to tell. At 63 years old I’m still living the dreams of my childhood. Here in the deserted marina, not one boat is launched. The sunny morning brought a few owners down to start checking things out before the yachting season, but the clouds and cold of the afternoon drove them all away. My beautiful vessel will be the first in the water around here it seems. There are some ice free launch ramps just to the north. I’ll head up there until I find one suitable to slip the Cap’n Lem free from the land and start my “one mile journey”. I like telling people “the trip is only one mile long, the mile that’s in front of me”. It won’t be hard to sleep tonight, though. One of the great gifts of a day’s hard work is quick and easy sleep. But tomorrow will come early and it will be a wonderful day. So the winds of change blow across the lake and there is open water where there was none before. Open, but not quite enough to put the Cap’n Lem in the water yet. Ships are coming and going now without the Icebreaker’s help. That’s a good sign. Late last night I heard one’s mournful call to the open the bridge. One long blast followed by two short blasts on the ships whistle, answered in kind by the bridge to signal its readiness to lift up and out of the way. It was as if it were calling me too, “Tommy, get ready, get ready…” I could hear the ship’s bow crunch through ice then nothing then crunch again. Putting the Cap’n Lem in the water is only a milestone. 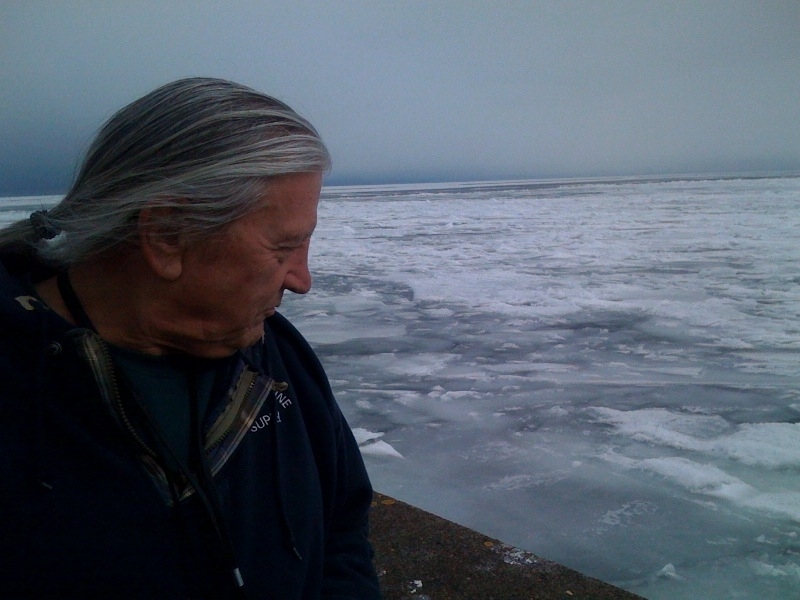 The trip began a long time ago, when I broke Arctic ice aboard the Coast Guard Icebreaker Polar Sea for the first time. That was the beginning of my love affair with the Arctic, that wonderful land and sea so far away, so cold and so very beautiful. Of course I don’t remember exactly when the idea that I could try the Northwest Passage first came to me. It just seems it’s always been there since those days. Does a voyage like this, a voyage of a lifetime, really need a beginning? Perhaps all it needed was to be dreamed, really dreamed, with no clear beginning and no clear ending. Then it needed me to get out of the way so it could happen in its time. And it needed me to realize this is not my voyage but our voyage. Going alone is not being alone. You are coming too. And that makes all the difference in the world. The fireplace onboard keeps the cold out and makes for a very pleasant workplace. I pulled wires and installed modems and inverters, GPSs and AISs, all kinds of weird and wonderful contraptions to make a sailors life safer at sea. All things Captain Lem’s first shipmates could never have conceived. “See through the fog?!! Never!” “Know your position, speed and direction… at a glance? How could it be!” they would say. (Oh, Captain James Cook, what would you have given for a chronometer like my little Timex, accurate to a second a year? Accurate time is accurate latitude and longitude. Accurate latitude and longitude is safety at sea. How amazed you would have been to see the little timepiece on my wrist.) But Captain Lem lived to understand the value of RADAR, LORAN, and even GPS, all strange sounding names to the landsman but life’s blood to sailors like us. They all need wires, + wires, – wires, red wires, black wires, brown, white, blue, and yellow wires They all needing to be pulled. . All that electricity my beautiful little windmill makes needs somewhere to flow! So I pulled wires yesterday. I’ll pull some more today. The plan was to sail away today. The plan has changed. Plan the day but accept the outcome. The bay is still frozen though there are patches of open water where the ice breaker has churned it into slush. So I have to do what I’ve learned to to so well. Wait. Yesterday brought snow and wind from the northeast and with it all the ice the lake still held. It jammed it hard against the harbor channel. So we wait. Time breaks ice and spring will come just not on my schedule. But what a great opportunity to practice the patience I’ll need later on and farther north. I can not do what the ice will not allow me to do. I’m always a guest on this watery world, never its master. So I’ll wait and care for my little craft, study my charts and plan the next mile. Having slept in to a very late 6:30 I got up to a beautifuly clear sunrise over the ice packed shoreline. It’s still there! Coffee and paperwork in the quiet of the morning. Yes, more paperwork. After all this is a business. The Good Book said it this way: “They that go down to the sea in ships do business in great water”. With the morning a came an old familier sound. 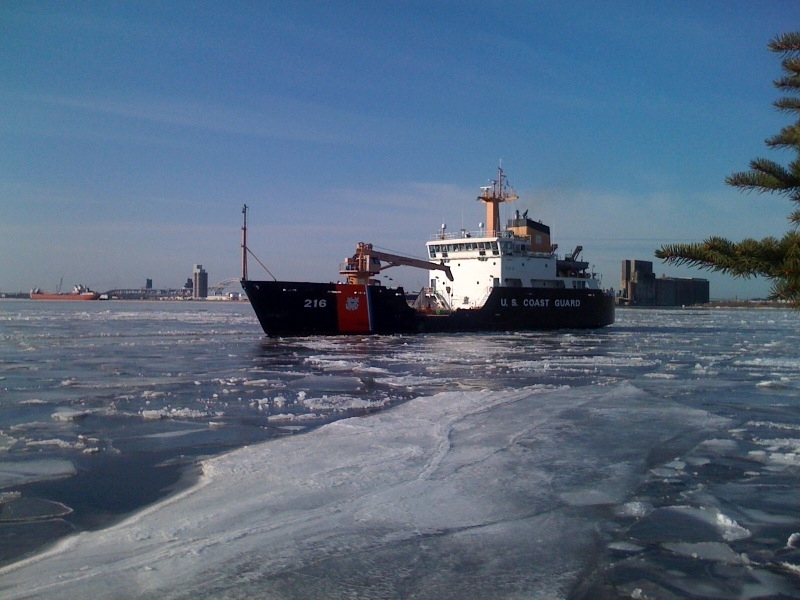 The Coast Guard Cutter Alder got underway from just across the pier to break up the ice for the ships needing to come in for their loads. We watched as they did high speed donut turns in the bay to crunch up the ice. Some ensign at watch is thinking “Now THIS is what I spent four years at the Academy to do!”. They were having fun, I know, I’ve been there. The Capt’n Lem is now 100% green. No more shore power needed. The Aero4gen is installed and making power. It’s been a powerful day. Power from the wind generator to the batteries, power from the batteries to the power panel, well you get the picture. The afternoon saw the arrival of another winter storm. We’re holding up between rows of sailboats on the hard (dry storage that is). The wind is howling through their rigging and the halyards are slapping the mast reminding us winter still has its hold on this end of the lake. Tonight we’ll pass the time eating hot from the oven cherry pie cooled with french vanilla ice cream. Waiting is so hard! Spent the morning filing receipts and fussing with a WiFi connection. Ah, the glamorous life of a sailor. Decided to take advantage of the beautiful sunny weather and run errands and prep the boat for the unseasonably cold weather. Following Dougs excellent advice, and after only a few wrong turns one which took me on a short trip to Wisconsin, filled up with propane and emptied the methane. Returned and with some minor electrical work fired up the glorious boat heater. Huddled around the flame. 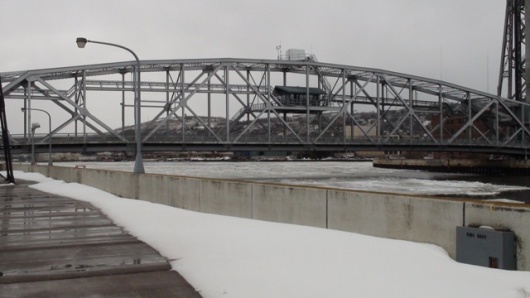 The Duluth harbor is almost open in spots, but a hundred yards of pack ice still block the end of the shipping channel and more snow and cold is on the way. When it became apparent the it may be July before we can sail out of here, again followed Dougs advice and scouted out more “Safe Harbor” spots, a series of boat launches along the Minneasota shore. Found less and less ice filling the harbor the farther north I went but more and more snow filling the launch ramps. Depending on the weather over the next few days, there should be a number of alternate locations to launch from. Met up with Captain Bruce for breakfast out in Mound Minnesota. Looks like Captain Bruce is giving up the sea for the life of a gentleman farmer, for now. The sea’l call him back before too long, once it’s in your blood it never leaves. Dropped off a picture for Janis and watched the kids chase the Pygmy goats around the yard. Never seen an artistic goat pen before but boy have I now. Made our way up to Duluth by late afternoon only to find the water a little harder than hoped for. 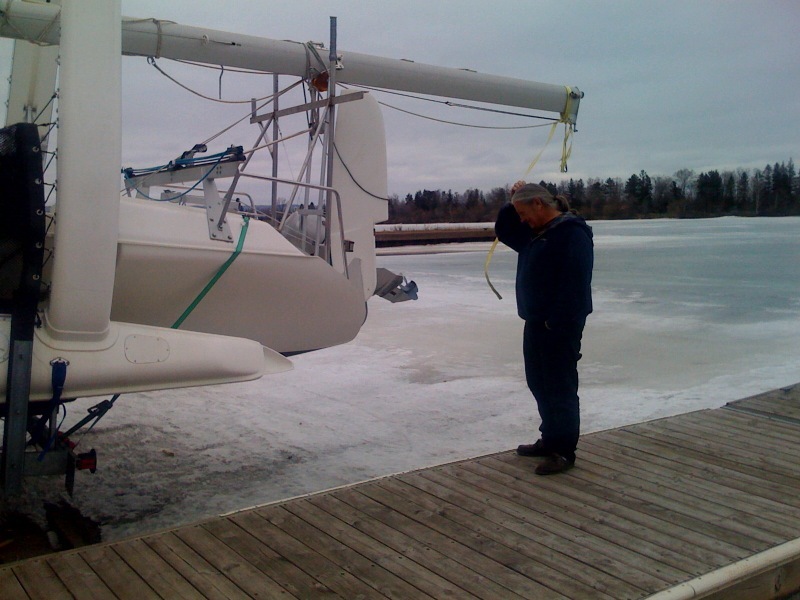 It was clear last week, but unseasonably cold weather brought pack ice blocking the boat ramps. A couple of days of above freezing and it should be all gone, but the weather channel is predicting 4 days of snow, so might head up the coast and look for open water middle of next week. Hunkered down at Harbor Cove marina for some last minute preparations. You are currently browsing the archives for the Finding a Harbor category.